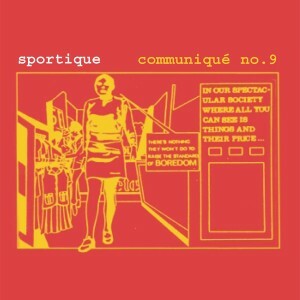 London's venerable pop pranksters Sportique release their third mini-LP Communiqué No.9, the follow-up to last year's astonishing Modern Museums, on April 28th. This time around they lament the passing of more radical artistic movements and attitudes prevalent in the late 60s and early 70s, touching on a bewildering number of musical touchstones along the way. Produced by the hottest property in London right now - Liam Watson at Toerag (The White Stripes, The Datsuns, Billy Childish) - this is the sound of music stripped of modern artifice. Songwriter Gregory Webster brings the same awareness of pop's back pages to this latest project as he's done since emerging with seminal jangle-pop pioneers Razorcuts (now also available again through Matinée Recordings), and his band of veritable indie-pop legends (Amelia Fletcher, Rob Pursey & Sir Mark Flunder) orchestrate the whole affair as effortlessly as we've come to expect.